The Creative Fall exhibition will run from October 20th through April 2018. The group show, representing established and emerging artists from Greater Portland will feature paintings, mixed-media pieces, drawing, photography, and collage. The rigorous selection process included curators and artists drawn from Portland’s arts community. Creative Portland offices and gallery are at 84 Free Street, directly across from the back entrance of the Maine College of Art. On the Gallery walls the works of local artists selected by their peers and colleagues will greet the public. From more than 150 submissions, the curatorial team selected less than 20 works to be exhibited. 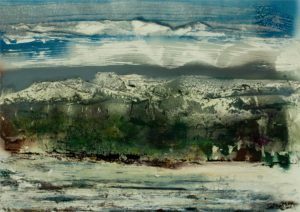 Salazar’s “Winter on Flat Top Mountain Maine” was selected. This painting is one of his series on Stonehenge paper 2014. Emily Southard, Program Assistant at emily@creativeportland.com.